There is unbelievable slowness shown by a handful of officials to implement GSMB's scientific systematisation activities. 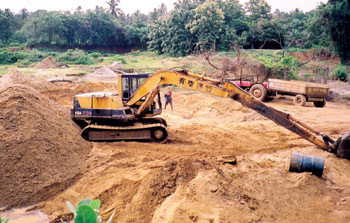 These personnel are alleged to be tarnishing the noble image of the Bureau which gives the impression to the public that the GSMB is in the payroll of the sand mafia. The unfortunate death of Mr. Ananda Mivanapalana 54 years ago was sad news for thousands of young men and women of the revolutionary intellectual and religious movements - the All Ceylon Buddhist Students Union - started by the Dutch Buddhist monk - Bhikku Dhammapala in early forties of the 20th Century.